And I thought to myself: this is weird. The first thing that’s weird is that the city’s population growth is limited pretty much to downtown and immediately adjacent neighborhoods, with a few patches here or there in what is otherwise a sea of stagnation or decline. Which is fine. Except that downtown is dominated by very high population growth (15% and over) – until it’s not, and all of a sudden in lots of places the next block over has either zero growth or actually has negative growth. That’s weird. In the absence of natural or immovable man-made barriers – neither of which apply much here – you’d expect a gradual transition from really hot areas with lots of population gains to transitional areas with some gains to the rest of the city. 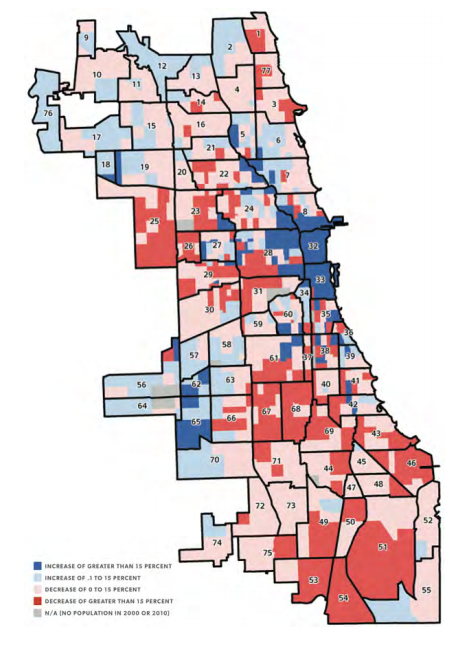 It seems unlikely that lots of people would be moving to Streeterville south of Chicago Avenue, for example, but Streeterville above Chicago Avenue is so unwanted that its population actually declined. Ditto with West Town east and west of what appears to be Racine or so. Why the disparity? Why the sudden cliff with population change? Laws. Downtown, and in certain adjoining neighborhoods, it’s legal to build very densely to meet the demand people have to live there. Cross the street, and in most places, it’s illegal to do so. 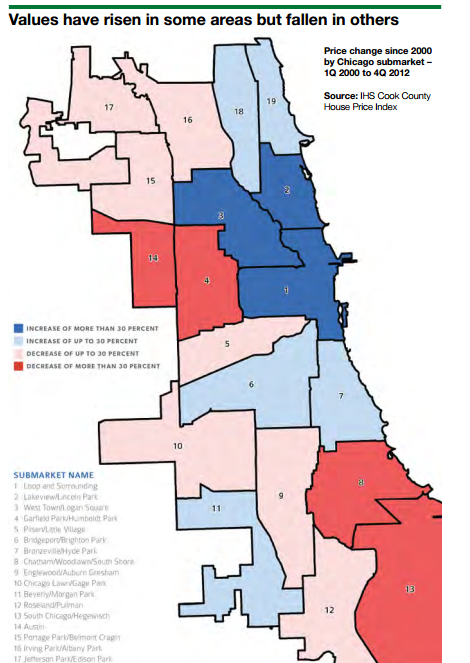 So even though lots of people would love to live in Lincoln Park – the area just north of the downtown population growth cliff – there’s nothing anyone can do about it. Except in the semi-industrial lands available for redevelopment along the river, population will stagnate. Or decline. More on that later. Anyway, for the sake of illustration, I’ve put a map of the city’s building laws below. As you can see, there are two types of zones I’ve highlighted: downtown zones, which automatically allow for very high density, are in black. The green areas are slightly more complicated: they’re Planned Developments, which basically means the city negotiates special rules with developers. Sometimes that means a dense development; sometimes it’s just something like an airport or a campus. 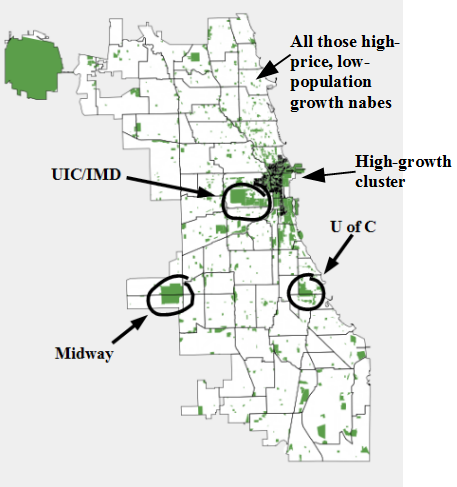 This isn’t to say that the city can make a neighborhood’s population grow just by rezoning it. Surely you could upzone large parts of the south and west sides without seeing any more construction than we have now. 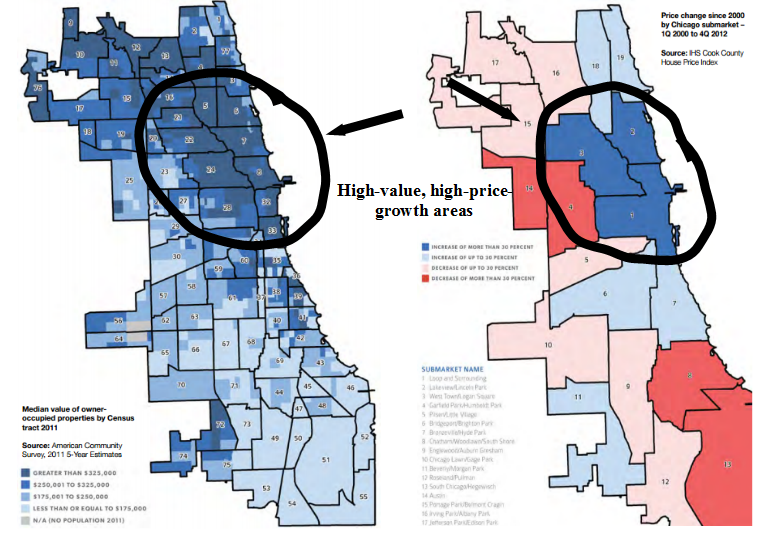 But in the places where home prices and population trends are telling different stories – where prices are skyrocketing while population stagnates – the city really is choosing to make growth illegal. 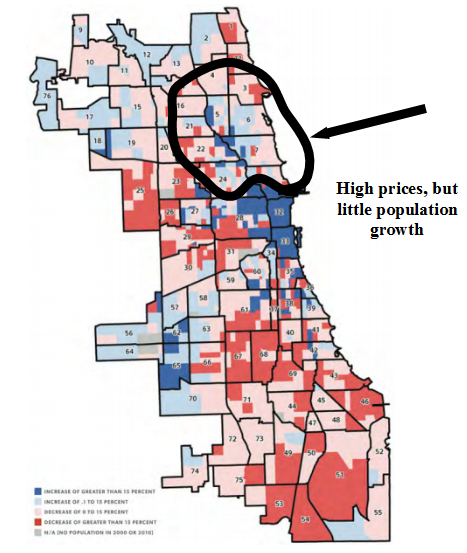 Which brings us, finally, to the third weird thing: The report that provides compelling evidence of that illegality is the same one that claimed only a few pages before that one of the city’s major housing goals is to increase its population. Maybe we should do something about that? Previous Previous post: School Markets, cont. I think there are other factors at work too. In Lincoln Park, the uber-rich have been buying up several adjacent lots and building castles. 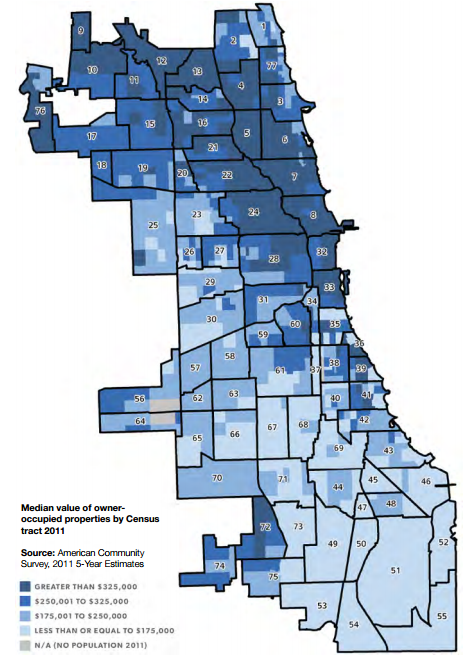 In Lakeview we’ve seen lot of immigrant displacement in the west, resulting in lower household sizes. This used to be able to be made up for by building taller, but the city downzoned much of the area. I think East Lakeview has seem some similar things, where rental housing packed in with young singles has been replaced with more upscale condo development.